Lackland Air Force Base, popularly known as the “Gateway to the Air Force,” is located at the edge of San Antonio’s south-west suburbs, and is unique for several reasons. It is a training base, and has been ever since construction began on a permanent facility to train aviation cadets in 1941. 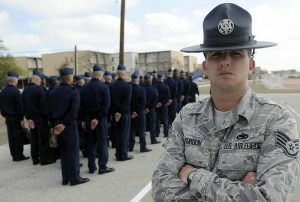 If you have served in the US Air Force at any time since the Korean War, the odds are very high that you have come to Lackland, since it was designated the main training base for officer and enlisted Army Air Force recruits in 1946, and continued in that capacity for the Air Force – although wartime demands during Korea and Vietnam sent overflow training missions temporarily to other bases in Texas, California and New York. Another singular oddity of Lackland is that for many years, it was an Air Force base without a flight line. Beginning as just another annex of Kelly – and housed in tents and flimsy temporary barracks, Lackland drew in more training missions, more and more buildings and schools, eventually becoming the sole provider of enlisted Basic Military Training (BMT) for regular active duty Air Force, Air Force Reserve and Air National Guard, even as Air Force basic and commissioned officer training moved to Maxwell AFB, Alabama. Ironically, in 2001, Lackland’s parent base of Kelly AFB shrank to a mere field annex of Lackland, following the closing of the San Antonio Air Logistics Center. With that closing, Lackland finally acquired an operational flight-line and a flying mission. Being relatively new, in contrast to established military bases around San Antonio – Randolph, Brooks, Kelly and Fort Sam Houston – Lackland itself boasts little in the way of historic buildings. Historical relics are confined to a half-century of aviation history, on static display around the perimeter of the parade grounds. Aircraft on display there include a B-52 Stratofortress, F-4 Phantom II, an SR-71 Blackbird, C-121 Constellation, B-17 Flying Fortress and a B-25 Mitchell. 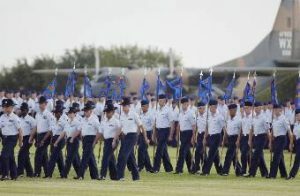 Every Friday morning, Lackland AFB hosts graduation exercises and parades at that parade ground, for graduates of Air Force Basic Military Training. Well into the 1990s, much of Lackland was housed in WWII/Korea era one or two-storey temporary buildings. Beginning in the late 1960s, when these structures were well past their “best if used by date,” substantial renovations and upgrades began with the construction of Wilford Hall. A modern, permanent 9-story hospital building and a 500-bed wing added several years later replaced a sprawl of 94 flimsy temporary buildings. A series of huge, and rather futuristic-appearing structures – with a ground-level core housing classrooms, mess halls and offices, and multiple upper-level barracks wings, built out on stilts above concrete pads which afforded shelter from the weather consolidated and replaced facilities which had formerly been scattered just as much as the hospital operations. Today, Lackland hosts more than just Basic Military Training. Working dogs and handlers for the DOD and various federal agencies are trained at Lackland, as well as Air Force Security Police personnel, pararescue specialists, explosive ordinance disposal experts and tactical air control, as well as enlisted aircrew specialists are all trained at Lackland. The Air Force Audit agency, Air Force News, and Tops in Blue – the annual traveling Air Force talent contest are all headquartered there as well as the Defense Language Institute’s English Language Center, and the Inter-American Air Forces Academy, which offers technical training for enlisted students from Air Forces throughout North and South America and the Caribbean. Another portion of Lackland, formerly a part of Kelly, is the Security Hill complex, which houses the Air Forces’s Intelligence, Surveillance and Reconnaissance Agency, among others. Nearby attractions include San Antonio’s Sea World, and Nelson Wolff Stadium, home of San Antonio’s minor-league baseball team, the San Antonio Missions – who often host ‘military nights.’ Suburbs and developments close to Lackland include Lackland Terrace, Rainbow Hills, Adams Hill, Heritage and Oak Creek.